Wash yourself of yourself. Rumi, The Essential Rumi. The edge of experience between Pisces melting and Aries emergence is a special moment, a turning toward something new mixed with a lingering memory of mysterious internal journeys. The Pisces time is made for cleansing and releasing those memories. Often, Pisces uses this talent too well, forgetting too much, escaping into shapeshifting fantasies. But sometimes, when the edge is crisp and clear, when the force of awakening is strong and the force of memory is too, then we are able to stand between those worlds and sense into the wholeness of surrender and rebirth. This wholeness is profound. It is the moment right before incarnating. It is the moment right before death. The moment of wholeness is lost too easily. Ordinary consciousness or oblivion erases the sensation too quickly. This week, we have an opportunity to hang onto the wholeness of consciousness for just a bit longer. I’m not sure, but I think stopping to acknowledge this special state will have an important impact on our journeys through the rest of the year. Lingering with our memories—stepping forward into the future. 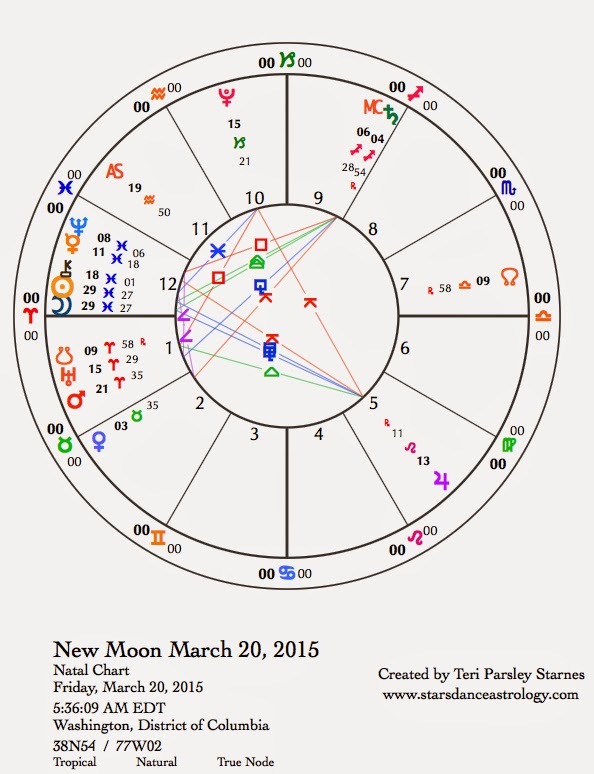 The New Moon, which occurs at the very last moment of Pisces, is potent. It is a Super Moon, which means the Moon is at its closes approach to Earth. There will be six Super Moons this year and this one will probably be the most powerful since it is also a Solar Eclipse. To add potency, later in the day the Sun enters Aries, also known as the Vernal Equinox in the Northern Hemisphere. This Moon is a portal between the worlds—memories hover here as shadows are cast on the Sun. But only for only a moment. The Sun quickly leaves the shadows to emerge with Aries fire. The urge to waken is strong. The last (of seven) exact squares between Uranus in Aries and Pluto in Capricorn occurs this week. When the Sun finally does emerge from Pisces, we will be well on our way into new paradigms. Most change is completely out of our control, yet a mindful awareness of this transition may help us maintain equilibrium and could provide a sense of directing our lives with conscious intention. It is all about choice. What memories from the recent inner journey do you want to remember longer than a fleeting moment? If we let the open portal of the coming New Moon stay open for a bit longer, what wisdom will come with us into the brightening Spring? March 16—Balsamic Moon: Surrendering. Rumi has written: “Be melting snow. Wash yourself of yourself.” This washing away of the late Pisces season mixed with the washing away of this phase of the Moon* prepares us for Spring. The idea of cleansing to make way for the Spring is not about cleansing away the “bad” parts of ourselves, rather it is about removing the defenses we no longer need. Where I live, winter requires us to wear many layers. After a while, it feels like these layers are a permanent part of our bodies. But this isn’t so. In order for a seed to germinate, the seed’s shell needs to burst open. Softening and shedding the layers helps us do that. If there remains any snagged or stuck tectonic plates in your psyche, today’s final Uranus/Pluto square may at last loosen them. Be prepared to flow, to respond to quickly changing situations and to let yourself open to the onrush of transformation. The Moon returns to Aquarius, the sign that began this lunar cycle. We see this rambunctious desire for change with new eyes. We realize every lasting and useful change takes a great deal of commitment and work. The square between Mercury in Pisces and Saturn in Sagittarius sets the tone for putting our efforts behind our ideals. Tuesday, March 17. The day is electric and still very much influenced by the Uranus/Pluto square of yesterday. The Aquarius Moon fits this energy to a tee. Aquarius is ruled by Uranus and thus feels perfectly at home challenging the status quo. Are you feeling your boat being rocked? Or are you doing the rocking? The opposition between the Moon and Jupiter in Leo early in the day gets us in touch with the personal impact of change. If you are feeling neglected or undervalued, time to do self-care. What brings personal joy? Venus enters Taurus today. We’ve been without significant earth influence for a while. Venus in this earth sign is a welcome return to body wisdoms and delights. Wednesday, March 18. Was it hard to wake up this morning? While we slept (CDT) Mercury joined Neptune in Pisces and the Moon entered the sign of the fishes as well. One of Hermes’ (aka Mercury) talents is the ability to induce sleep and dreams. These dreams are necessary for the process of learning from the past. Lessons are being condensed into symbols and images as touchstones for the emergence into Spring in just two days. The waning old Moon is evoking the same thing—messages from the subconscious. What is bubbling up? We may not immediately know how to interpret these oracles, but over time these messages could be quite valuable. Thursday, March 19. Remember how a seed’s shell needs to be softened before the young seedling can emerge? Let that intention of softening guide you today. This is the last day of the Aquarius-Pisces lunar cycle. A lot of shifting has happened this month. Feel the reverberations slowly dissolving the barriers to transformation. Remember all that has brought you to this moment. March 20—New Moon: Dreaming. Solar Eclipse. Vernal Equinox. “Emergence through the portal of change.” That is what I am calling this lunar cycle. The Super Moon Solar Eclipse at the last degree of Pisces is as good a portal into change as any I can think of. Here’s why: Eclipses are good at wiping out old patterns to make way for new ones. The last degree of Pisces is unique, it isn’t just the last degree of a sign, it is the last degree of an entire year (the astrological year begins with the first degree of the next sign, Aries). We really are at the portal of change with a fabulous opportunity to erase old patterns as we move into a new year. What baggage will you leave at the door? What intentions will you pick up on your way through? Not all of this is conscious. Some change is completely out of our control. Perhaps the real opportunity here is to choose how we greet the inevitable changes that come our way. Eclipses can bring a bigger amount of change than usual. You might be in that place right now. We are still feeling the reverberations of the most recent and last square between Uranus and Pluto. We are noticing revolutions, upheavals, and transitions all around us. Many have felt we are at a turning point in human history. Joanna Macy calls this impulse the Great Turning—the shift from the industrial growth society to a life-sustaining civilization. This is not a simple transition. The ongoing square between Uranus and Pluto, which will continue to influence us for quite some time, has been a wake-up call about the kinds of changes we need to make. Uranus alone is about change but when Pluto is added into the mix, the change goes deeper. The process of change becomes as important as whatever changes we wish to make. There is little room for mistakes. The stakes are raised. This is the context for this lunar cycle, which is really more about Aries than Pisces. Aries is the sign of bold action followed by panic, or my friend Mercy says, “Aries is the sign of bold and shy.” Standing on the portal of change, with the light of the Sun mysteriously disappearing, we leap into a vast unknown. Although the jump looks intentional and all brave and everything, there really isn’t a choice. It’s time to go. The cast of characters (otherwise known as planets) who play a role in this emergence will come forward when the time is ripe. Just know: a square between Saturn in Sagittarius and Neptune in Pisces will begin to be more and more important as the year goes on. Belief systems and ideals influence political and personal choices. This could easily lead to more war and conflicts around belief. Jupiter in Leo will continue to remind us to check in with our egos and whether we are getting the recognition we need. The ideal is to use that energy to act with more nobility. Venus in Taurus until April 11 replenishes the storehouse of sensual delights. Mars in Aries for the rest of March encourages us to disperse energy and anger through action. The mantra for this Mars is: I must be true to myself. Saturday, March 21. Let fire be an inspiration. Sun, Moon Uranus and Mars are in fire sign Aries, sparking renewal, pushing us forward. One of the essential needs for Aries is the option to go against the crowd. It isn’t that Aries is always being contrary to what everyone else expects from them, but they definitely need to have that option. What kind of individualistic option do you want to have for your Spring emergence? Maybe you don’t want to be nice anymore, or maybe you don’t want to be so predictable. There are many ways to show our true identities and to let ourselves try on new ones. The Moon conjoins Uranus and squares Pluto today re-igniting tensions about power and change. Venus draws boundaries with Saturn. The conflict could be about values and could feel like no one is ready to compromise. Sunday, March 22. Remember the earth? Remember the ground beneath your feet? The taste of delightful food? The pleasure of a good massage or luxurious fabric on your skin? Do you remember that the whole reason we wake up into Spring is to stoke the flames of earth’s rebirth? Today we have the opportunity to remember all that. Mercury’s connection to Pluto is lusty and poetic. The Moon conjoins with Venus; be sure to look in the west at sunset to see the pair dancing together. Let the beauty soak into your flesh, creating peace and pleasure together.